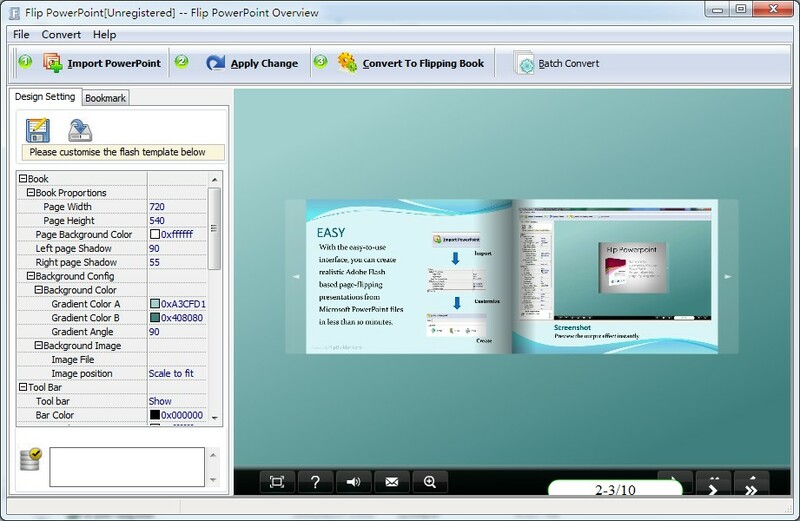 With Flip PowerPoint, you don't need any additional software. Import your PowerPoint Presentation or scan from paper, configure book look&feel and convert. This is the best way to create digital (electronic) editions such as any type of publications, magazines, brochures and catalogues. Digitally publishing your documents has never been so easy and affordable. Define titles, icon, window size for EXE page-flipping ebooks. * Provide multiple templates (default provided or download from website). * Define your language for flash. * Import bookmarks (outline) with PPT, and edit them manually. * Import hyperlinks with PPT, include web link, page link, email link. * Import text with so text is searchable. * Preview the output effect instantly. * Set eBook size, choose landscape or portrait. * Define titles, keywords and other metadata. * Define titles, icon, window size for EXE page-flipping ebooks. * Define book margin size manually. * Add encryption to protect created page flipping eBooks. * Insert background music, always play or define times. * Set book reading from right to left (such as Arabic). * Set page-flipping time manually. Qweas is providing links to Flip Powerpoint 3.2 as a courtesy, and makes no representations regarding Flip Powerpoint or any other applications or any information related thereto. Any questions, complaints or claims regarding this application Flip Powerpoint 3.2 must be directed to the appropriate software vendor. You may click the publisher link of Flip Powerpoint on the top of this page to get more details about the vendor.